Born in 1941 in wartime England, Ray Thomas picked up harmonica at the age of nine. He was in the Birmingham Youth Choir and in October 1958 he joined a skiffle group called The Saints and Sinners. The band split up in June 1959. The Saints and Sinners helped Ray discover how well his vocals were received by audiences. Next, he formed El Riot and the Rebels, featuring Ray Thomas as El Riot dressed in a green satin Mexican toreador outfit. The band won a number of competitions in the Birmingham area. It was here that Ray became known for making an entrance onstage by sliding to center stage on his knees. On one occasion Thomas sent a row of potted tulips flying into the audience. El Riot and the Rebels appeared several times on a local variety show called Lunchbox. 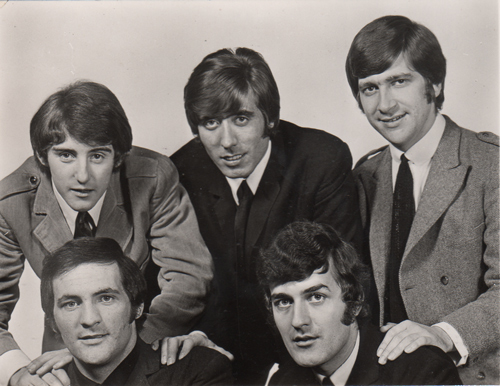 They made their debut on Lunchbox on November 14, 1962, and played “Guitar Tango” and “I Remember You”. Mike Pinder joined El Riot and the Rebels on keyboards. On April 15, 1963, El Riot and the Rebels performed at The Riverside Dancing Club in Tenbury Wells as the opening act for The Beatles. Pinder went off to serve in the British Army. When he returned, Thomas and Pinder left El Riot and the Rebels and formed a new band called the Krew Kats. The Krew Kats played in Hamburg, Germany, for four months. They played at the Top Ten Club which The Beatles had made famous. But the Krew Kats didn’t see the money they were expecting. Thomas and Pinder had to walk 417 miles from Hamburg to the English Channel and borrow money for ferry fare back to England. Once they were back in Birmingham, Thomas and Pinder were searching for other mates to form a new band. Seeing what was unfolding with the British Invasion, they signed up Denny Laine from The Diplomats on vocals and guitar. Clint Warwick, formerly with The Dukes, was on bass. For drums, they chose Graeme Edge, formerly with The Avengers. In addition to being lead singer, Thomas played flute and harmonica. Pinder was on keyboard and mellotron. Initially, they called the new band The Moody Blues Five. But within months they billed themselves as The Moody Blues. The band recorded a single in November 1964 titled “Go Now”. In 1965, the single climbed to #1 on the UK singles charts and #5 in Vancouver. Though it stalled at #10 on the Billboard Hot 100, it landed at position #50 for the Top 100 Year-end singles of 1965 published by Billboard in December ’65. The band went on tour as an opening act for The Beatles. Expectations were high for a big followup single. However, the next eight single releases were all flops. In 1966, Denny Laine left the Moody Blues and was replaced by Justin Hayward. Laine would later join Wings, Paul McCartney’s band, from 1971 to 1981. Clint Warwick left to become a carpenter and a steady replacement was eventually found with John Lodge. Justin Hayward was born in 1946 in Swindon, UK. After playing in school bands, at the age of 15 he bought at Gibson 335 guitar. The instrument would feature in all his studio recordings with the Moody Blues. In 1965, Hayward was in the band with Marty Wilde and The Wild Life. Hayward had auditioned for The Animals. Though he didn’t get hired, Eric Burdon passed on Hayward’s name and demo’s to Mike Pinder of the Moody Blues. While John Lodge, also born in 1946, met Ray Thomas when he was 15 years old. They kept in touch and when Clint Warwick exited the band, Thomas was in touch with Lodge about becoming a new member. In 1967, nine single releases after “Go Now”, “Nights in White Satin” was released. It climbed to #1 in the Netherlands, #5 in Austria and #6 in Switzerland and Belgium. However, it stalled at #19 in the UK and fared no better than #103, just beneath the Billboard Hot 100. The song would be reissued in 1972 and become an international Top Ten hit. The followup to the 1967 release of “Nights In White Satin” was “Tuesday Afternoon”, from the album Days Of Future Passed. The London Philharmonic Orchestra was featured on the album. 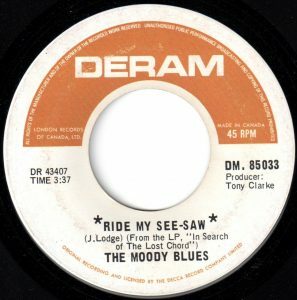 Though the single didn’t make the UK singles charts and stalled at #24 in the USA, it climbed to #3 in Vancouver in August 1968. Touring with material from the album was a challenge, unless the band lined up an orchestra to accompany them on stage. Next, the band released two singles from the album In Search of The Lost Chord. The second of these was “Ride My See-Saw”. Written by John Lodge, the see-saw that the narrator in the song is riding is not all fun like being a child on a teeter-totter. But, even for children, a see-saw isn’t always fun. When you are on a see-saw, a child sits on each end. They take turns pushing their feet against the ground to lift their side of the see-saw into the air. Often, see-saws have handles for the riders to grip as they sit facing each other. But if a child hits the ground suddenly after jumping, or exits the see-saw at the bottom, the other child will rapidly fall to the ground, risking injury. It is the downside of being on a see-saw that seems to be the focus of “Ride My See-Saw”. The singer invites someone else to ride their see-saw, to take their place and “have my seat, it’s for free.” Usually, if the ride you are on is fun, you don’t bother offering your place to someone else. But this is a see-saw that teaches some hard lessons. In the song, the narrator reflects that although they were taught in school that one and one is two, they now know “that answer just ain’t true.” Furthermore, in their increasingly spinning world, “everything is lost that I found.” What was once certain, stable and trustworthy has all been upended. People who ride this see-saw are running a race against time and have to run like a fire. Jacky shall have a new master. In North America, a seesaw is often referred to as a teeter-totter. This is a word from Norway: tittermatorter. In a teeter-totter, you are said to be teetering on the edge when you are lifted into the air while your playmate is landing on the ground. Charity associations gave see-saw demonstrations when playgrounds were introduced in North America at the turn of the 20th century. In Canada “Ride My See-Saw” climbed to #12 on CKLG in Vancouver and on CKLW in Windsor, Ontario. In America, the song did best in San Diego at #2, Fresno, CA, at #5, Los Angeles and Louisville at #7, Tulsa, OK, at #9 and #10 in Cincinnati. In 26 states across the USA, “Ride My See-Saw” got next to no airplay. Their next album, On The Threshold Of A Dream, climbed to #1 on the UK album charts. It went platinum in Canada, however “Never Comes The Day” didn’t make it onto the pop charts. In 1969 the band released To Our Children’s Children. The album climbed ti #2 on the UK charts and #14 on the Billboard 200 Album charts. But again, no single release was a commercial success. But in 1970, the album A Question of Balance featured the single “Question.” Though the song only made the Top 30 in the USA, it climbed to #2 in Vancouver. The album climbed to #1 in the UK, #3 in the USA and sold platinum in Canada. Building on that success, Every Good Boy Deserves A Favor went to #1 in the UK in 1971, #2 in the USA and was certified platinum in Canada. It also featured the song, “Story In Your Eyes.” The single stalled at #23 in the USA, but peaked at #1 on CKVN in Vancouver. In 1972, The Moody Blues released their eighth studio album, Seventh Sojourn. Again, the album was a best seller and accompanied by the Top 20 hit, “Im Just A Singer (In a Rock and Roll Band)”. After a world tour with a band called Asia in 1973, the Moody Blues took a break while individual bandmates did some solo work. After a five year hiatus, in 1978 the band reunited to release Octave. Mike Pinder wasn’t happy with the album and opted out of the tour to support it. In 1981, they released Land Distance Voyager. The album was a chart-topping best seller in the USA and Canada. It went Top Ten in the UK and New Zealand. A single, “The Voice”, climbed into the Top 20 in the USA and #1 in Vancouver. In 1986, the band had a Top Ten hit with “Your Wildest Dreams”. The Moody Blues released their 16th studio album, December, in 2003. Clint Warwick died in 2004. Since then, the Moody Blues have released four live albums, the most recent, Days of Future Passed Live, released in 2018. The live concert took place at the Sony Centre for the Performing Arts in Toronto, Ontario, in 2017. In 2017, the Moody Blues were inducted into the Rock ‘N Roll Hall of Fame. Currently (November 2018) the Moody Blues (Justin Hayward, John Lodge and Graeme Edge with backing musicians) are scheduled for eleven concert dates in February and March 2019 across four southeastern states and one Caribbean cruise. Ray Thomas bio, Ray Thomas.co.uk. Justin Hayward bio, Justin Hayward.com. Andy Greene, Moody Blues’ Justin Hayward on Rock & Roll Hall of Fame Honor: ‘It’s Amazing!’, Rolling Stone, December 13, 2017. Scott Mervis, Denny Laine talks Wings, Moody Blues, ‘Band on the Run’ tour, Pittsburg Post-Gazette, May 3, 2017. Pierre Peronne, Clint Warwick: Bassist with the original line-up of the Moody Blues on their transatlantic hit ‘Go Now’, Independent, UK, June 3, 2004. George W. Harris, John Lodge: Isn’t Life Strange?, Jazz Weekly, January 1, 2018. Moody Blues tour dates, Moody Blues Today.com. Opie and P. Opie, The Oxford Dictionary of Nursery Rhymes (Oxford University Press, 1951, 2nd edn., 1997), 297-8. The Downward Slide of the Seesaw, New York Times, December 11, 2016.